The FTD® Because You're Special® Bouquet. Pick a day - any day - to tell someone how important they are. 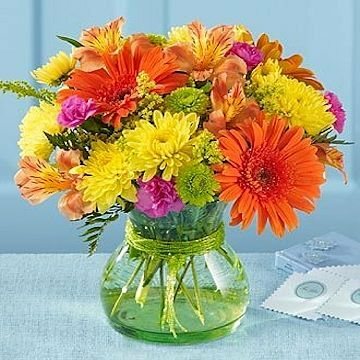 Send them this exuberant, brightly colored bouquet of orange Gerbera daisies, yellow poms, hot pink mini carnations, and vivid green button poms in a sleek, beaded green glass vase. Guaranteed to bring a smile! Standard bouquet includes 9 stems. Approximately 11"H x 10"W.
Deluxe bouquet includes 16 stems. Approximately 12"H x 12"W.
Premium bouquet includes 22 stems. Approximately 13"H x 13"W.